Retro Viewer Custom Reel: Your own images in a classic viewing toy. With the ability to constantly take and store pictures on our phones, memories these days can start feeling disposable. While not all pics are worth treasuring (sorry, #brunchpics), save your special photos in a special way by ordering a Retro Viewer Custom Reel. 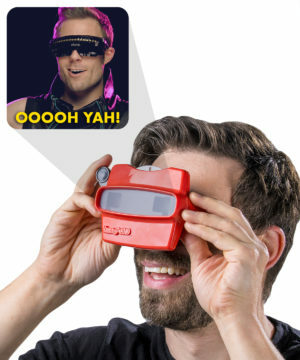 Like the childhood toy you remember, the Retro Viewer offers a fun and immersive way to view slides. Now instead of looking at random scenic photographs and goofy cartoon characters, you can view moments from your life! Simply upload your images to the Retro Viewer website, add 3D text and other customizable features, and you’ll be shipped a circular reel of personalized nostalgia. The vintage charm of the Viewer makes it perfect for commemorating weddings, anniversaries, family vacations, and any other memories you want to make more memorable. 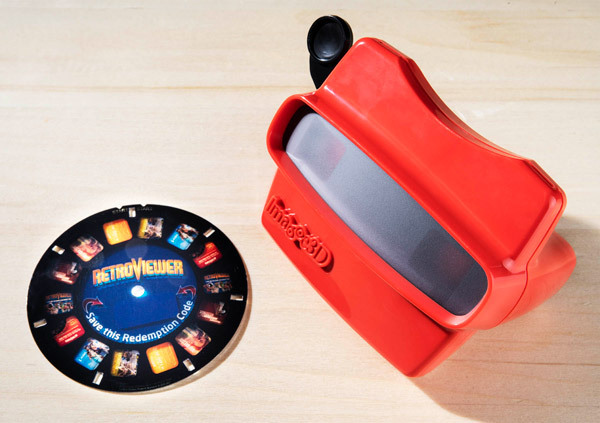 The Retro Viewer Custom Reel taps into a favorite toy of childhood to put your life on display as you’ve never seen it before. Look through the binocular viewing display to see your favorite memories in vivid, stereoscopic glory. The viewer adds a charming nostalgia you can’t get from digital albums and a more engaging presentation than a simple photo print. Plus, according to our research, it’s approximately 1000 times more fun than a vacation slideshow presentation. See your favorite memories in a whole new way! The Retro Viewer site makes it easy to customize your reel so that it includes all of your precious (or just stupidly funny) moments. Once you have uploaded your image, you can customize each one to get the perfect scale, brightness, and coloring. When you’re done, add a sweet caption (or a funny comment) by overlaying 3D text on the image. With seven images on each reel, you’ll capture the best pictures from your best moments. Create your own 3D reels! Each order of the Retro Viewer Custom Reel includes the viewer, a sample reel (to get you excited), and instructions to order your custom reel. Give a reel as an adorable anniversary gift, keep one out at a graduation party, or give them to your family as a keepsake from your last family vacation. It makes those trips down memory lane a little more fun. Includes viewer, sample reel, and code for free custom reel. Question: How do I upload my images to Vat19? Answer: You will actually upload your images to the Retro Viewer website. We send you the viewer and a redemption code to order your reel from Retro Viewer. Question: So do I have to pay for the reel when I upload my images? Answer: Nope! The redemption code we send you gets you a free reel. You will only need to pay more if you want more reels (which you might because they’re awesome). Question: So I’ll be in 3D? Answer: The image you upload will be displayed in 2D, but the text you add will be in 3D. Question: Your site says each reel has seven images, but I count 14 slides in the pictures. How does it feel to be a liar? Answer: We wouldn’t know! Each reel holds seven images, but each image is duplicated on the reel. This creates the stereoscopic effect that makes these viewers so cool.